Beyond Bree is delighted to celebrate its tenth colour calendar, featuring fan selected imagery from the past, in a deluxe version for 2019. If you missed collecting the earlier calendars, this is your chance to enjoy some wonderful interpretations of JRR Tolkien’s Middle-earth! There are also some new renditions of past works to give long time collectors new versions of old favorites. This is Calendar Editor Daniel Smith’s tenth “Beyond Bree” Calendar, and he has done something special! The 2019 “Beyond Bree” Calendar features favorite art from past “Beyond Bree” calendars, a magnificent center picture by Ted Nasmith, and black-and-white art specially colored for this calendar. Pricing: $20 plus shipping – USA $2.00, the rest of the world $5.00. For large orders, please inquire for details. For PayPal orders please add $1.00. When using PayPal, log onto your account and enter your payment amount by using the “Pay or Send Money” button. 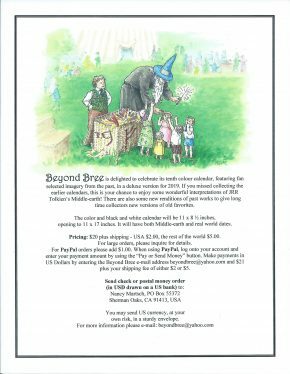 Make payments in US Dollars by entering the Beyond Bree e-mail address beyondbree@yahoo.com and $21 plus your shipping fee of either $2 or $5. Send check or postal money order (in USD drawn on a US bank) to: Nancy Martsch, PO Box 55372, Sherman Oaks, CA 91413, USA. You may send US currency, at your own risk, in a sturdy envelope.